MINISTER of Commerce, Industry and Trade Manqoba Khumalo has had a very busy first week at work. Khumalo, who officially began his ministerial duties last Wednesday, has been having a series of meetings with various stakeholders, as well as attending key national events. His first day began with meeting staff members one on one in their various offices within the inter-ministerial building in Mbabane; followed by a meeting with all heads of department. He then met with the CEO and board of directors of the Eswatini Investment Promotion Authority (EIPA). Last Thursday, he met with the Commissioner General of the Eswatini Revenue Authority Dumsani Masilela, before rushing to Senate for a session. Thereafter, he attended a Cabinet meeting and later met with Prime Minister Ambrose Mandvulo Dlamini. His Friday began with an early morning meeting with the CEO of the Industrial Development Company Eswatini (IDCE) Phiwayinkhosi Ginindza; which was followed by a meeting with the IDCE executive and board. 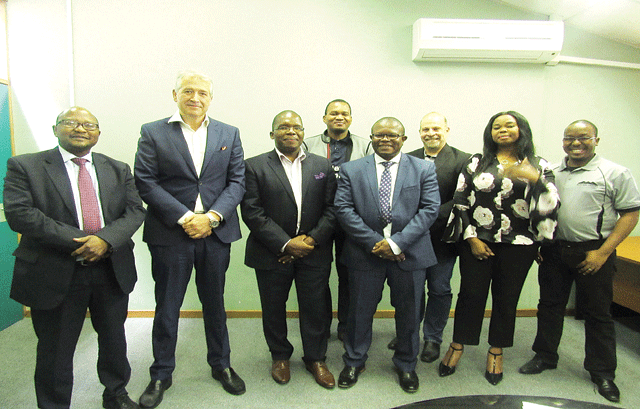 Thereafter, he met the executive and board of Business Eswatini and later the board of directors of the National Industrial Development Corporation of Swaziland (NIDCS). His evening concluded with him addressing the Metropolitan Evangelical Church during their fundraising dinner, where he was guest speaker. Then last Saturday, he attended the MTN SWAMA Awards ceremony held at the Royal Swazi Spa Convention Centre. This week, the minister began with him attending a two-day Cabinet Task Team meeting. During the two-day meeting, he was able to also meet with the Eswatini Sugar Association CEO Phil Mnisi. In most of these meetings, the minister was unpacking his three-pronged strategic vision for the ministry of commerce, industry and trade. The minister hopes to, among other things, create an export driven economy; make Eswatini globally competitive and make the country be a centre of business excellence. The deliverables to this vision will be significant increase in exports, foreign direct investment, employment and attaining and sustaining an Ease of Doing Business index that will position Eswatini in the top 10 in Africa, and top three in Southern Africa. “I’m committed to these aspirational goals. My driving ambition will be to deliver this vision and put Eswatini on the road to prosperity for generations to come. I would like to invite all of you to share in my passion as we re-imagine and renew the business landscape in Eswatini together,” he said, addressing stakeholders.